What is an Irrigation Technician? An irrigation technician is responsible for irrigation installation and makes sure that all the equipment is functioning properly by performing regular testing. Any repairs needed on the irrigation equipment is also the technician’s responsibility. An irrigation technician needs to be able to operate irrigation controllers, pipes and sprinkler heads as well as work with all the electrical wiring required to operate the system. Finally- a class that teaches you the technical part of Landscaping, so you are qualified for hire as management and supervisor-level positions. Training includes hands on experience on small equipment and motorized lawn mowers. Learn the proper way to the job per the Arizona Registrar of Contractors so that you can direct and supervise your crew with confidence and knowledge. Class is 80 hours and includes Irrigation Assembly, Irrigation Components, Irrigation Clocks, Backflow Systems, Control Systems and Troubleshooting Systems. Core Training to guide you for the National Pesticide Applicator Certification Core Exam using the U.S. EPA and PMRA text books and our Licensed Instructional Staff. 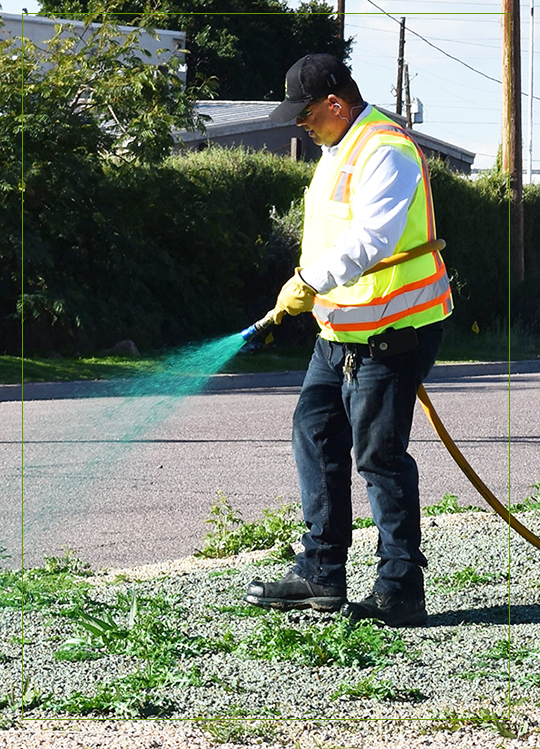 C4 Right – of – Way Training is Pest Management, including weeds, in the maintenance of public roads, electric power lines, pipelines, railway, and other similar right – of – ways. This is the class that Certifies and Licenses you to be a LANDSCAPE SPRAY TECHNICIAN and a PEST CONTROL TECHNICIAN. We train you in detail for the Core Exam and the C4 Right-of-Way Exam. Class includes background testing and application fee. It’s 60 hours of training and designed to give you the knowledge to pass the exam. We walk you through the steps to prep you for the Exam with Arizona Department of Agriculture. Graduated are awarded Certification and License from Arizona Department of Agriculture. We take the tough out of learning and passing the most important part of the License! Get certified and licensed in an industry that is in demand! Learn to design landscaping for residential. This class is the basics of Landscape Design and is offered to you in online study for your convenience. Learn the proper way to plant, design, and install per the Arizona Registrar of Contractors. Class includes design planning, working with design graphics, irrigation, and sprinkler systems. Learn how to do basic estimating. Earn your Certificate in Landscape Design.